G-20 leaders had one thing on their minds when they gathered in Toronto in June 2010: debt. Their response to the crisis over the preceding three years was effective in stabilizing markets, buttressing the global financial system, and supporting growth through coordinated fiscal stimulus. But these bold actions took their toll. Increased spending, tax cuts, bank bailouts, and the impact of automatic stabilizers saw a sharp increase in debt and deficits. From 2007 to 2018, G-20 countries added $33 trillion to the global stock of debt. 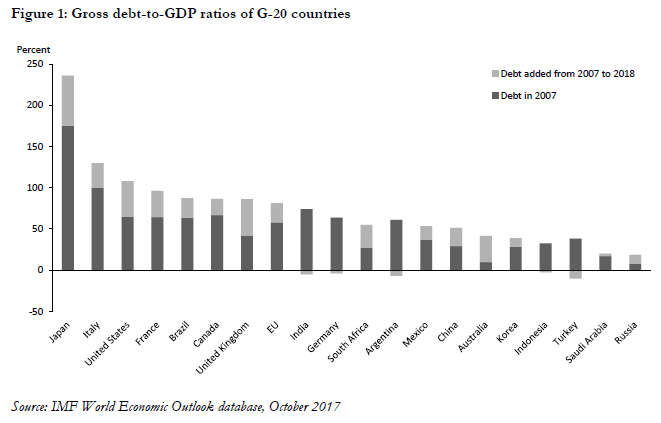 The weighted-average debt-to-GDP ratio of G-20 countries increased by more than 40 percent from 2007 to 2018 (Figure 1 gives the unweighted gross debt-to-GDP ratio for each G-20 economy). In Europe, ballooning debt and deficits in the context of a single currency and monetary policy sapped-confidence, triggered a debt crisis that spread across the continent. G-20 leaders warned of a global debt problem when they met in Toronto. They declared that ‘recent events highlight the importance of sustainable public finances’ and G-20 countries needed ‘to put in place credible, properly phased and growth-friendly plans to deliver fiscal sustainability’ (G-20, 2010). The result was the Toronto commitments. Most G-20 advanced economies committed to halve their deficits by 2013 and stabilize their debt-to-GDP ratios by 2016. The commitments excluded the emerging markets. They also excluded Korea, which was in surplus, and Japan, which was deemed to have special fiscal circumstances given its substantial stock of debt, most of which was held domestically. The G-20 was an institution designed to manage both the crisis and the post crisis recovery, including how to return national balance sheets to something that was sustainable over time. This was always a critical part of its mandate – Kevin Rudd, 26th Prime Minister of Australia, interviewed 8 September 2017. The G-20 faced criticism for its dramatic switch from stimulus to consolidation. Many argued, particularly with the benefit of hindsight, that the G-20 began consolidating too early and that inflexible targets were inappropriate. Debates were heated within the G-20, too. There was strong disagreement between leaders that wanted consolidation—led by Angela Merkel and Stephen Harper—and those that did not—led by Barack Obama and Naoto Kan. When I came in as Treasury Secretary there was a long-running debate in the G-20 between austerity and growth, which I would say ended pretty clearly in favor of growth, but with some different ideas of how to get there—Jacob Lew, former Treasury Secretary, United States, interviewed 7 September 2017. The support for fiscal consolidation among G-20 countries was buoyed by forecasts of a quick ‘U-shaped’ recovery from both international organizations and many domestic finance ministries. But these forecasts failed to materialize. The IMF’s World Economic Outlook report for October 2012 conceded that the fiscal multipliers being used for its post-crisis forecasts, which helped underpin policy advice for fiscal consolidation, were underestimated. Rather than being between 0.4 to 1.2, they were up to twice that: between 0.9 to 1.7. This meant the withdrawal of government spending would have a more pronounced negative short-run effect on the economy than anticipated. From 2010 to 2013, it became clear to the G-20 that the cost of its original commitments would be higher than initially thought and many countries would struggle to achieve the Toronto commitments. A growing number of finance ministers argued the recovery was too weak to warrant the consolidation implied by the Toronto commitments. Although it was never formally announced, in 2013 the G-20 abandoned the Toronto commitments and replaced them with the St. Petersburg fiscal strategies (G-20, 2013). Each G-20 country, now including Japan, Korea, and the emerging economies, drafted a strategy with specific fiscal policy commitments (such as infrastructure investment and expenditure and revenue measures), as well as a broad strategy for medium-term fiscal sustainability. Despite the G-20’s efforts, however, debt and deficits remain high. The question explored in this paper is whether G-20 coordination could help reduce them. The answer to this question, however, critically depends on the answers to several other questions: Has the G-20 been successful in its previous attempts to coordinate the reduction of debt and deficits? Is there a case for coordinated fiscal consolidation in the first place? Does coordination ease the pain of fiscal consolidation or does it make it worse? If the latter, is there another form of coordination between G-20 countries, some kind of ‘grand bargain’ scenario, that could help? Is this politically feasible? And, finally, does the G-20 influence the policies of its members or are claims of coordination merely a facade? 20 countries. These individuals make up the G-20 and are responsible for shaping the policies in their countries. The findings of this paper are a testament to the generosity and openness of these policymakers in discussing their experiences in global economic cooperation. Participants included Kevin Rudd, Janet Yellen, Haruhiko Kuroda, Ben Bernanke, Jack Lew, Mark Carney, and 55 other politicians and officials to whom I am deeply grateful.